Part 2: Is it ever too late to get ‘retirement ready’? Next up: When should I start Planning? Where does your spending power in retirement come from? How much money do you need in retirement? It’s an intriguing question that is often difficult to answer as there are various ways of assessing your requirements.You can make your calculations in terms of capital or try and articulate a weekly income figure based on your current spending trends. However, analysing where and how the capital and income is created is crucial to sustaining a healthy retirement and is easier to answer. 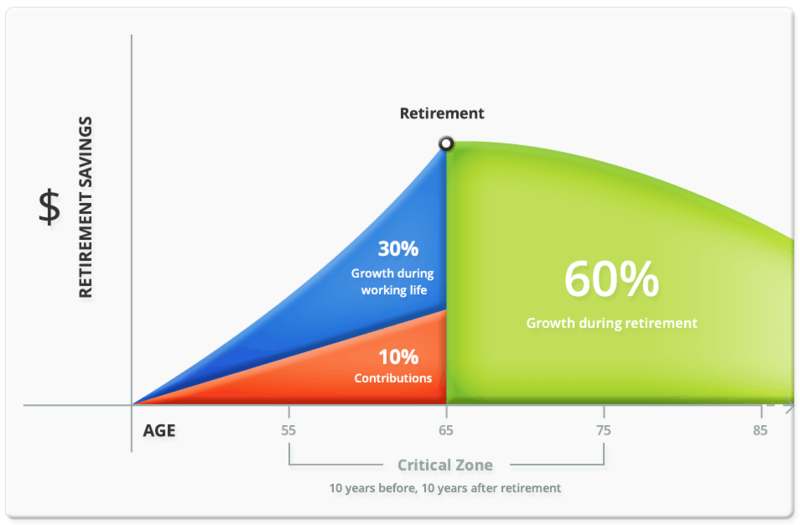 60% of your retirement spending power is an outcome of growth during retirement itself. Let’s highlight that last very significant point again. 60% what you spend in retirement, is created during retirement itself. Therefore, you are funding the majority of your retirement once you have retired. With longer life expectancy and better health care, retirement today can stretch over 30 years, therefore, maintaining a similar return in accumulation and decumulation is the basis of many industry studies on the savings gap needed in retirement. What if I withdraw my super at retirement and put the funds in cash? Many Australians consider taking their super as a lump sum and putting it into a bank account or Term Deposit at retirement. It’s an enticing prospect that looks attractive at face value. 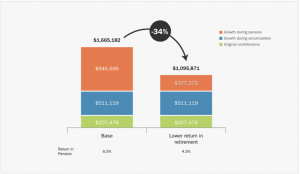 However, Chart 2 shows that by putting 100% of your retirement savings into cash/Term Deposits (assuming you receive 4.5% in long-term bank investments rather than 6.5% from a diversified investment strategy) you effectively decrease the amount of money you will have to spend in retirement by 34%. That’s over one-third of your retirement income – gone. Imagine looking at your retirement bucket list and then tearing a third off the page! How upset would you feel? Especially if the situation could have been avoided. The numbers are eye-opening and stress the value of maintaining a diversified portfolio in retirement. If you keep a balanced approach, 60% of the money you spend in retirement will actually be created during retirement. Ellerfield has created a detailed and tailored retirement program called F.O.C.U.S.2. ® (Framework Of Certainty. Understanding. Strategic Solutions.) Explore the topics below and take control of your future. Is it ever too late to get retirement ready? How much income am I going to need in retirement? Are there ways to enhance my age pension entitlements during retirement? What is the biggest risk I face in retirement? Who can my super go to and will they pay tax? I have a basic will, is this sufficient?